Having a lightweight power drill around the home can be rather helpful. There are quite a useful tool to have around. The tool should, however, be good enough to be used on a range of tasks and projects. The FD02W 12V Max from Makita has been designed to be capable of fulfilling those requirements. Apart from being lightweight, it is compact without losing out on performance. That is one of the reasons why it can be a good addition to a professional handymans kit. Moreover, it is the creation of a trusted manufacturer. As per the Makita FD02W 12V Max review, the drills white shell has been made out of hard plastic. This, in turn, is covered with black rubber in the most important places strategically. As a result, a non-slip grip can be achieved. At the same time, the rubber acts as a protective layer for the machine by preventing it and the surface it is kept on from unnecessary damage. Of course, the grip improves the control as well. Interestingly, the grip is rather hefty considering the compactness of the tool. The control over the drill is further improved by the topnotch balance and low weight. Users will have little to no problems in positioning the drill and guiding it during operation. This power drill from Makita features a two-speed mechanism. It is possible to choose between the two with the help of a slider switch which has been placed on the top of the tool. The switch is strong enough to lock the drill into the selected speed range. More importantly, it is possible to use it even when wearing gloves. The lower speed range has a limit of 350 RPM while the limit for the upper speed range is 1,300 RPM. The speed range will be satisfactory for most users. It is possible to use the higher range with bits that have a maximum diameter of a quarter inch. If larger bits have to be used then the lower speed has to be selected. This allows the tool to build up enough torque to allow the bit to be driven. According to the Makita FD02W 12V Max review, it was noticed that trigger possesses a long usable range. On the other hand, it takes some effort to select and then hold a specific speed level. The motor will reach the top speed three-fourths into the range of the trigger. As such, the trigger is decidedly average. Another point to be noted is that the direction selector switch is rather small even in comparison to most cordless drills. While the switch works correctly, it has a tendency to get stuck at times. This will not be much of a problem if this tool is going to be used mainly for drilling. In this Makita power drill, the friction chuck has been paired with a clutch featuring 18+1 positions. Care has been taken to ensure that each setting of this clutch is unique and serves a purpose. For example, Setting 16 is capable of sinking a 3 inch screw into wood of construction grade without any tripping. On the other hand, the lower range settings of the clutch can trip at lower torque levels. As a result, the tool can be quite useful for intricate projects. The Makita FD02W 12V Max review shows that the work light has been included above the trigger. Of course, this type of placement tends to produce a number of limitations in the capabilities of the light and this power tool has them all. The tools barrel has its shadow cast on the area above it. Moreover, the drills impact point does get blanketed in darkness once the tools chuck reaches 3 inches off the surface of work. On the other hand, the light will automatically come on even if the trigger is pressed lightly. It will also turn off automatically after 10 seconds once the trigger has been released. Being an LED light, it is capable of producing bright light that can nicely illuminate the area directly in front. This drill by Makita has a maximum capacity of 3/8 when operating on steel. For wood, the maximum capacity is 13/16. As such, the capacity is reasonable enough for home projects. The charger is one of the best features as per the Makita FD02W 12V Max review. It has been crafted so as to be functional and durable at the same time. The charger is capable of charging the battery to full from zero in less than 30 minutes. Therefore, it is possible to use the drill with one battery while charging another without worrying about the charge. By the time the battery in the drill dies, the other one will be ready to use. An LED with two colors has been installed in the charger to let the user know what is happening. When the LED turns green, it denotes that the battery has been charged completely. Like the charger, the battery included in this drill is of a high quality. 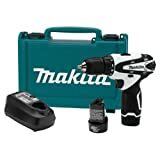 This drill uses a lithium-ion battery which is more compact than the earlier nickel cadmium battery used by Makita. Thanks to the li-ion technology, it is possible to charge the battery whenever required without memory effect. Moreover, the manufacturer has had great foresight in including two batteries with the kit. Therefore, users will not have downtime for charging when working on their projects. For the FD02W 12V, Makita is offering a warranty of 3 years on the drill. The warranty for the charger and the battery is different as it covers only 1 year. Nonetheless, the warranty is a reasonable one for this drill. The Makita FD02W 12V drill/driver is a good tool. While there are certain aspects which might not be pleasing to everyone, the fact remains that it is still suitable for most home projects.